A Philadelphia-bound PATCO train on the Benjamin Franklin Bridge. Saturdays should be smoother running for PATCO commuters between South Jersey and Philadelphia. 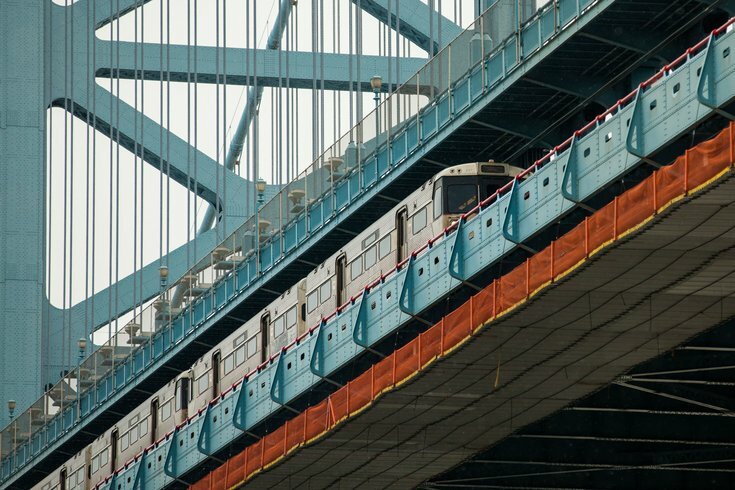 Beginning April 9, trains will run every 20 minutes, rather than the 25-minute departure schedule PATCO operated during major track repair work, which wrapped up in February. The upshot is one extra train per hour on Saturdays, according to John D. Rink, general manager of the train line that connects Philadelphia and South Jersey, crossing the Delaware River via the Ben Franklin Bridge. But there are also tweaks to the entire schedule, which can be found here. “It’s a great enhancement,” Rink said. Weekday intervals remain as they were with trains arriving at as frequently as every four minutes during peak periods and every 12 minutes at midday. With lower demand, Sunday service remains at 30-minute intervals. The project replaced wood ties, running rails, supporting steel trusses, electrical cabling and signaling systems. A $13.9 million, 30-month-long project to replace tracks in both directions at the Westmont PATCO station in Haddon Township, New Jersey, is pending. A new schedule for SEPTA's regional rail lines, which connects with PATCO, goes into effect Sunday.